So, things got busy in the past two months. The end of the school year brought extra events in my teaching job, good weather meant more climbing trips and then, there was my ongoing effort to get better at route setting in the climbing hall. So, not a lot of time for sewing. I did make some simple things but didn't really find the time and/or motivation to take picture and write blog posts. Yet, that is. The school year has ended now so I have a bit more time on my hands and I have some projects I would rather like to show off and talk about. I've decided to try and post about all the things I made over the this past couple of months although I can't promise long, in-depth posts and great photoshoots about all of them. I'll start out with this super-simple dress (with E's help, I took pictures of four items today which will be in three blog posts. I didn't really have a lot time or feel like posing for pictures so I hope you can put up with fairly bad hair and the occasional weird facial expression). 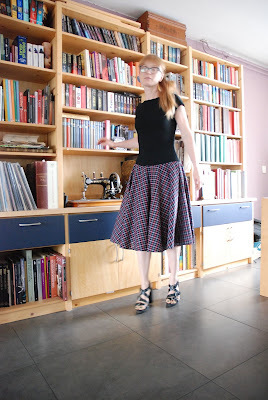 It's just my favorite go-to self-drafted jersey top with the cut-on cap sleeves (it would be wrong to call it is a T-shirt because it is not in the shape of the letter T...) with a circle skirt attached to it. I shortened the top to about 10 cm below the waistline (12 at the back) and tightened the waistline a little. I cut the skirt to size to attach to that line. No zipper needed. Super quick to make, super easy to wear. The top is made from black viscose/rayon jersey, the skirt from a fairly lightweight, but a bit stiff cotton. I like the way the checks on the skirt shift in angle because I just cut a full circle from this fabric an used it like that. Simple, but very effective. I do something similar with thrift store shirts and attach flared skirts. I love a dropwaisted dress. This looks great on, isn't it wonderful to look great and feel so comfortable? I agree - why oh why haven't we seen this all over the blog world? I LOVE IT! I absolutely must make one myself!